Oil sprays on the trunks of citrus trees prevent infestation by aphids, mites and mealybugs. These pests will eat a tree's young leaves and buds, preventing it from fruiting. Oil sprays can also be used on infested areas of citrus trees to remove the insects without harming any of the delicate growth. Both commercial horticultural oil sprays and homemade oil sprays are effective against citrus tree infestations of aphids, mealybugs, mites and scales. Horticultural oils are easier to use if your trees have a large infestation or if you have a lot of trees that you want to protect. If you only have a few trees or only a small area is affected, it often makes more sense to make your own spray. Cottonseed oil and soybean oil are the two vegetable oils that work well as insecticidal sprays, notes Colorado State University. Oil sprays suffocate the insects by coating them in a film of oil. Oil is much more fool-proof than chemical insecticides because it doesn't target any of the insect's specific biological functions, and instead simply blankets the whole area, making it impossible for the insect to breathe. If you are preventing an infestation, coat the bottom 3 feet of each citrus tree in a mixture of oil, water, and a little bit of soap. This can be done with a rag, or with a 5-gallon sprayer, depending on how much trunk you have to coat. If you already have an infestation, fill a plastic spray bottle with the mixture and spray it directly on the insects. The oil sprays should only be used when outside temperatures reach 40 degrees F. Spray the tree early in the day, on days when the temperature is not projected to go above 80 degrees F, so that the sun doesn't burn the coated leaves. The spray should remove aphids immediately. Mealybugs and scale insect may take two applications of the oil spray to penetrate their protective coatings, but you should never spray the tree more than once a day. Insect egg sacs will absorb the oil and kill the eggs, even if they don't disappear immediately. Because oil sprays are mechanical insecticides, and not chemical, they can damage and kill any insect they coat, so you must be careful not to spray any beneficial insects, such as ladybugs, which can help fight infestations. 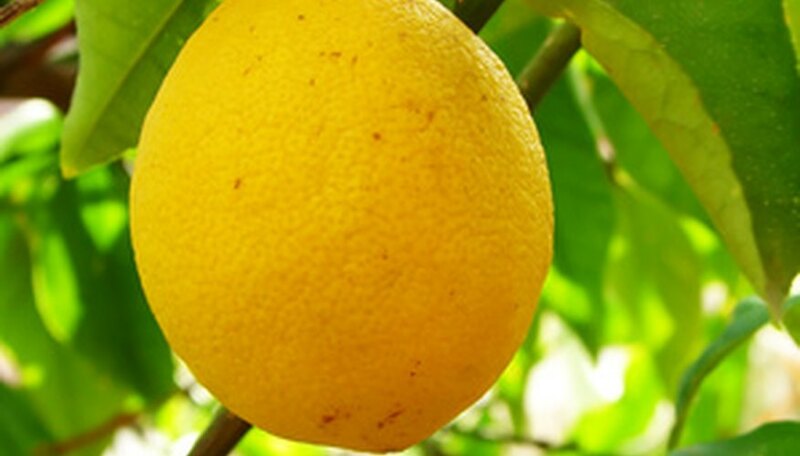 Overly concentrated oil sprays can also damage the leaves of citrus trees, so follow the manufacturer's instructions for commercial sprays, and do not to mix the homemade spray with too much oil, or spray more than once a day. For a 1 qt. spray bottle, mix 1 tbsp. vegetable oil with the bottle full of water, and add a few drops of liquid soap, such as Ivory, which will act as an emulsifying agent and will keep the oil and water from separating. Shake well. For a 1 gallon bucket, mix together 1 cup vegetable oil, 2 tbsp. liquid soap, and 1 gallon water. You may need to re-mix this several times as you use it to make sure the oil remains evenly distributed throughout the mixture. If you are making a 5-gallon mixture, use the same ratio of ingredients and simply multiply everything by 5.